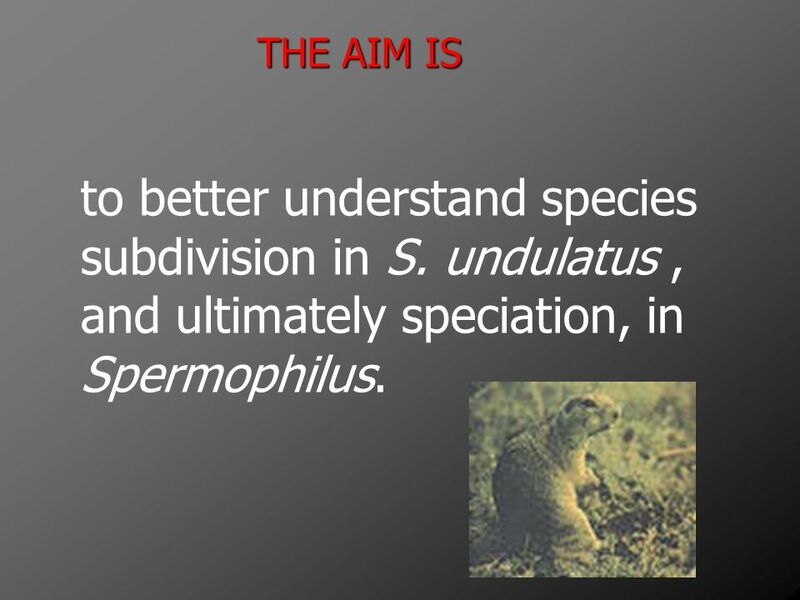 6 THE AIM IS to better understand species subdivision in S. undulatus , and ultimately speciation, in Spermophilus. 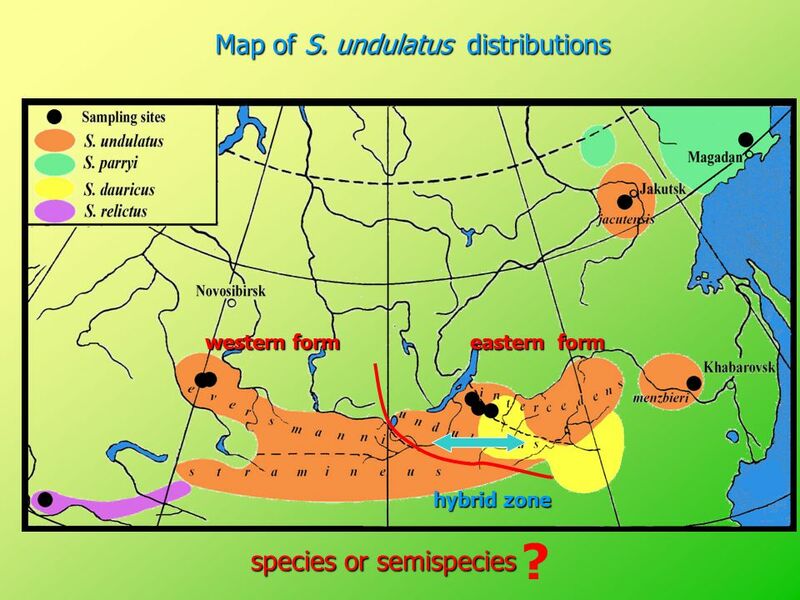 MATERIALS Map of sampling localities western form eastern form S. relictus, S. dauricus and S. parryi, S. taurensis and S. xanthoprymnus were chosen for comparative analyses, Tamias sibiricus was chosen as outgroup taxon. 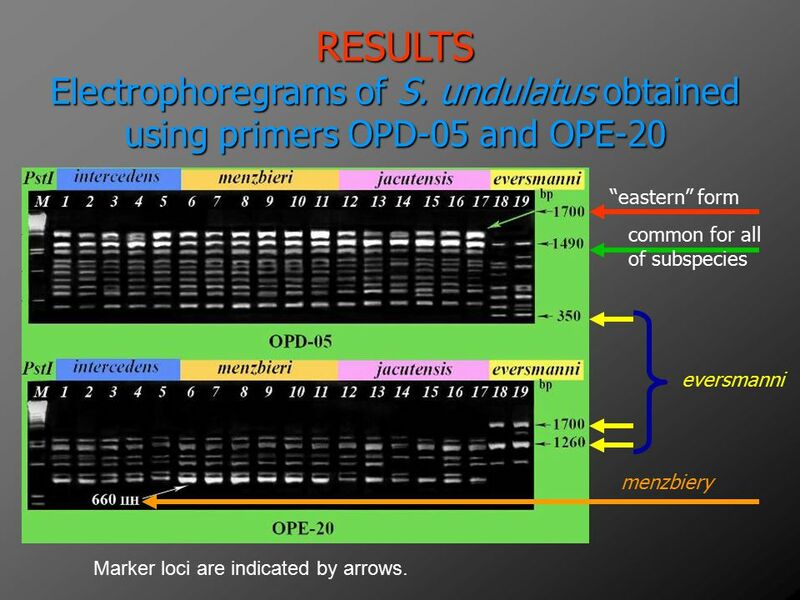 11 RESULTS Electrophoregrams of S. undulatus obtained using primers OPD-05 and OPE-20 “eastern” form common for all of subspecies eversmanni menzbiery Marker loci are indicated by arrows. 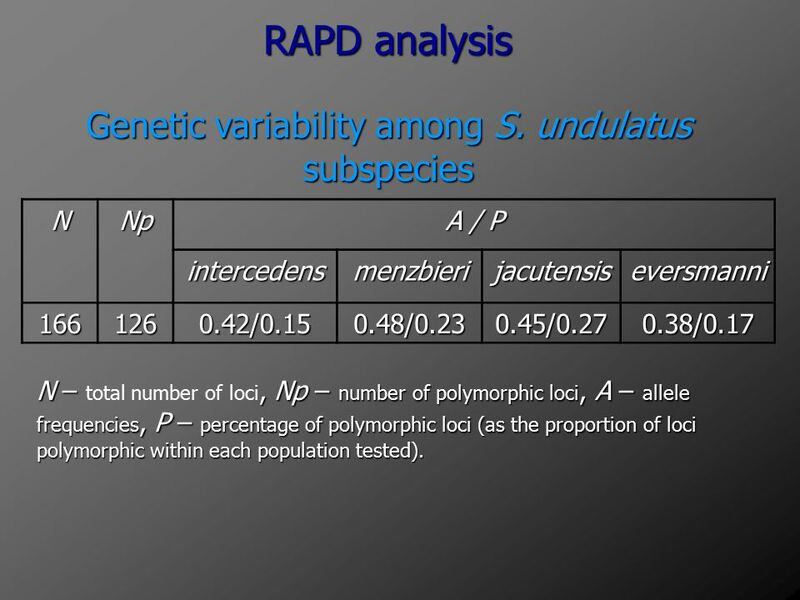 RAPD analysis Genetic variability among S. undulatus subspecies N Np A / P intercedens menzbieri jacutensis eversmanni 166 126 0.42/0.15 0.48/0.23 0.45/0.27 0.38/0.17 N – total number of loci, Np – number of polymorphic loci, A – allele frequencies, Р – percentage of polymorphic loci (as the proportion of loci polymorphic within each population tested). n DN p (Ex) intercedens / menzbieri 10 0.7 1.00 menzbieri / jacutensis 12 0.8 intercedens / jacutensis 0.6 eversmanni / “eastern” form 19 0.40 0.00 S. parryi / S. relictus 6 0.41 S. dauricus / S. relictus 0.42 S. dauricus / S. parryi 0.46 n- number of samples, DN - genetic distances (Nei, 1972), p (Ex) - probability (exact test for interpopulation differentiation (Raymond and Rousset, 1995). 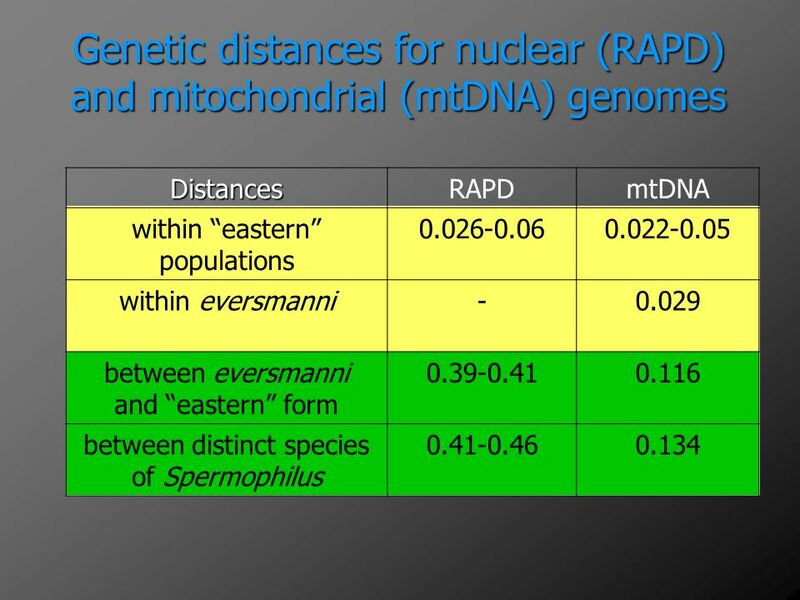 18 CONCLUSIONS Both nuclear and mitochondrial DNA analyses showed that the subspecies of “eastern” form were close to each other and far from subspecies of “western” form. 2. 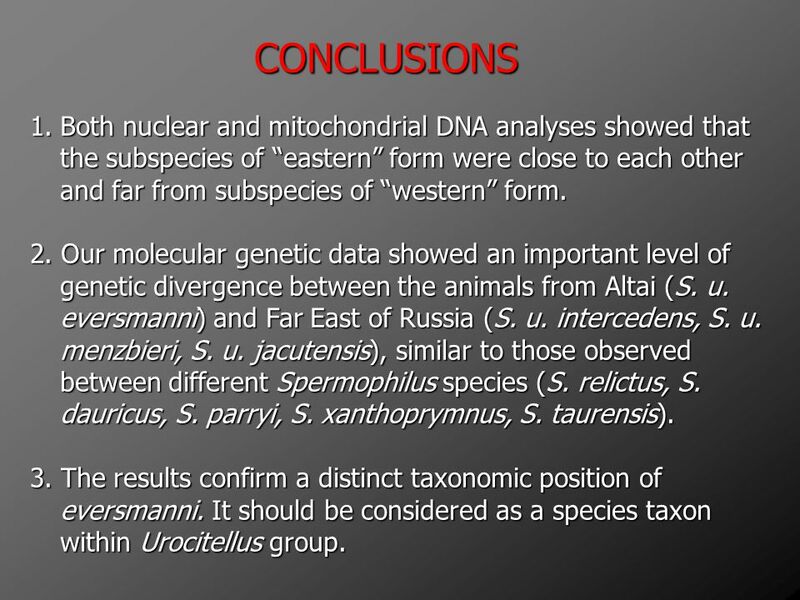 Our molecular genetic data showed an important level of genetic divergence between the animals from Altai (S. u. eversmanni) and Far East of Russia (S. u. intercedens, S. u. menzbieri, S. u. jacutensis), similar to those observed between different Spermophilus species (S. relictus, S. dauricus, S. parryi, S. xanthoprymnus, S. taurensis). 3. 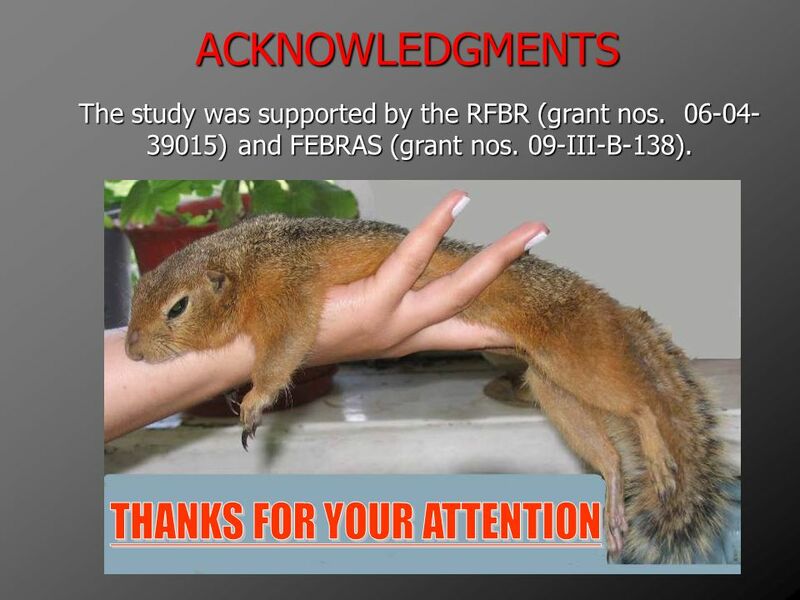 The results confirm a distinct taxonomic position of eversmanni. 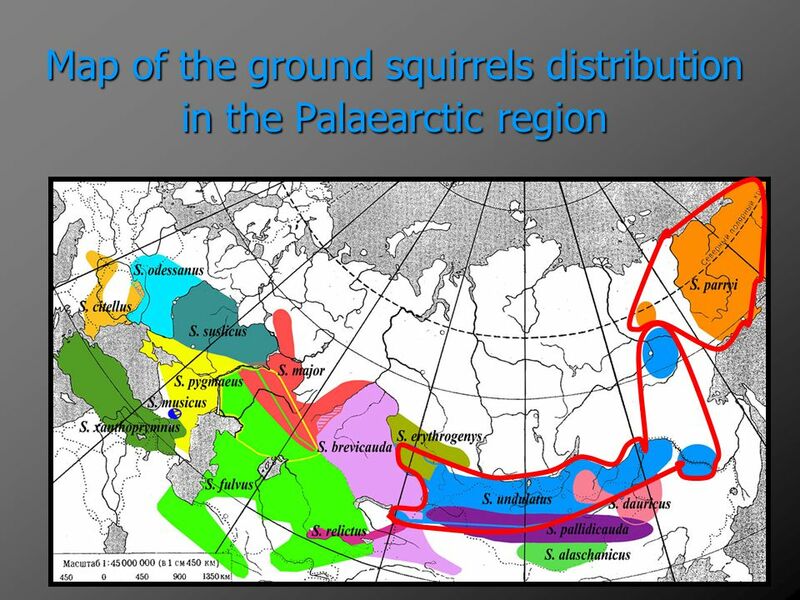 It should be considered as a species taxon within Urocitellus group. 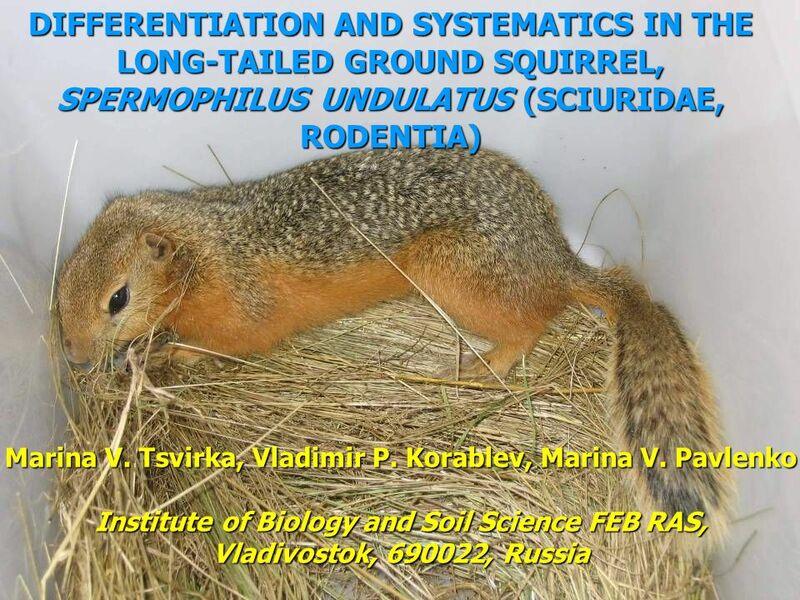 Download ppt "DIFFERENTIATION AND SYSTEMATICS IN THE LONG-TAILED GROUND SQUIRREL, SPERMOPHILUS UNDULATUS (SCIURIDAE, RODENTIA) Marina V. Tsvirka, Vladimir P. Korablev,"
APPLICATION OF MOLECULAR MARKERS IN THE STUDIES OF PHYLOGENY AND PHYLOGEOGRAPHY: ADVANCES, PITFALLS AND PERSPECTIVES OF DEVELOPMENT Abramson N.I., Kostygov. Diversity of two forms of silver crucian carp Carassius auratus gibelio based on mitochondrial DNA analysis Diversity of two forms of silver crucian carp. 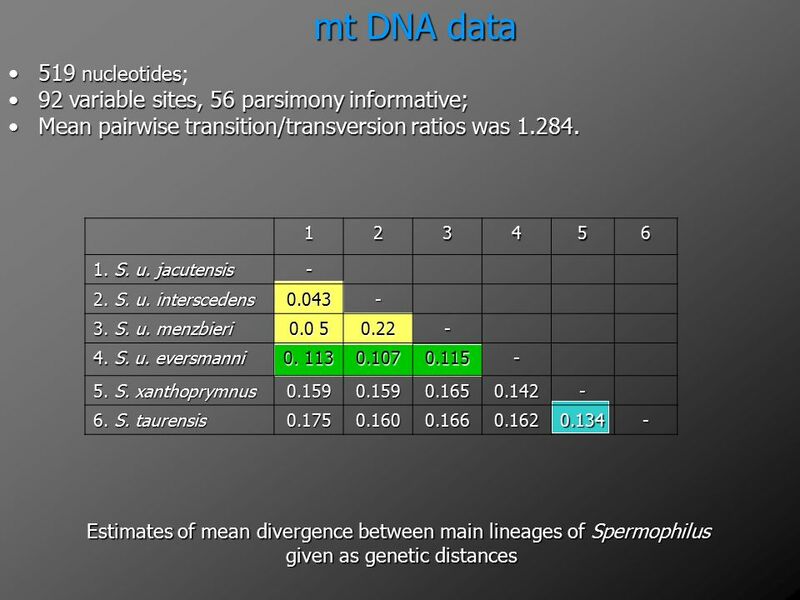 Molecular-genetic analysis of starfishes Asterias amurensis and A. rubens A.L. Drozdov, I.P. Vladychenskaya,, N.B. Petrov red seastar A. rubens, red seastar. Amorphophallus titanum Largest unbranched inflorescence in the world Monecious and protogynous Carrion flower (fly/beetle pollinated) Indigenous to the. 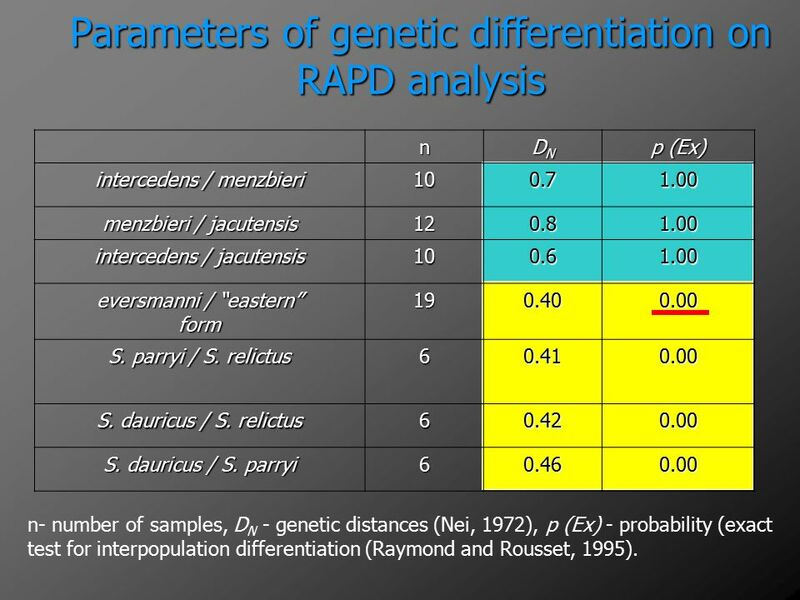 Sampling distributions of alleles under models of neutral evolution. 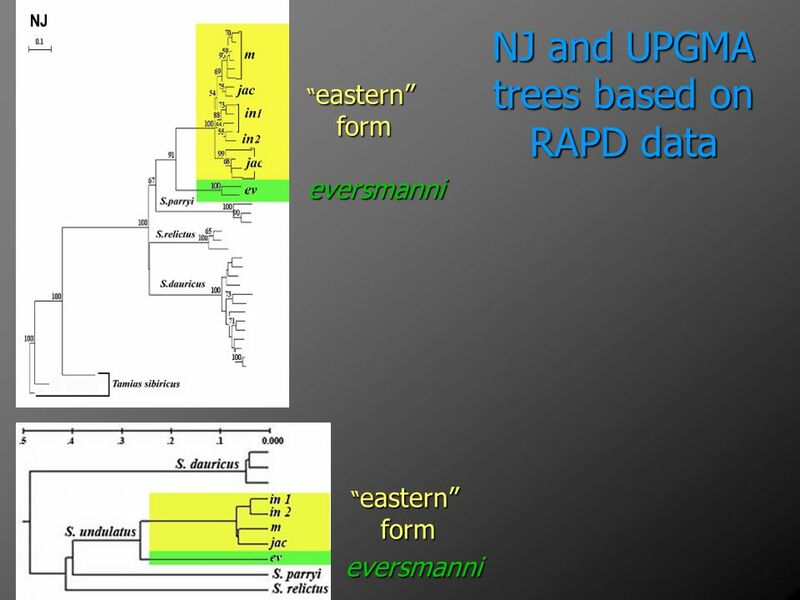 1 General Phylogenetics Points that will be covered in this presentation Tree TerminologyTree Terminology General Points About Phylogenetic TreesGeneral. Classification of Living Things. 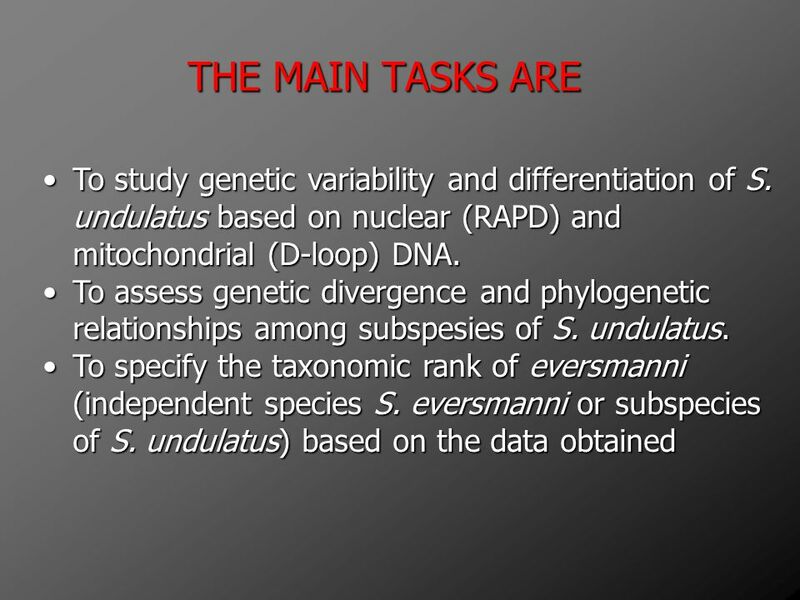 2 Taxonomy: Distinguishing Species Distinguishing species on the basis of structure can be difficult  Members of the. 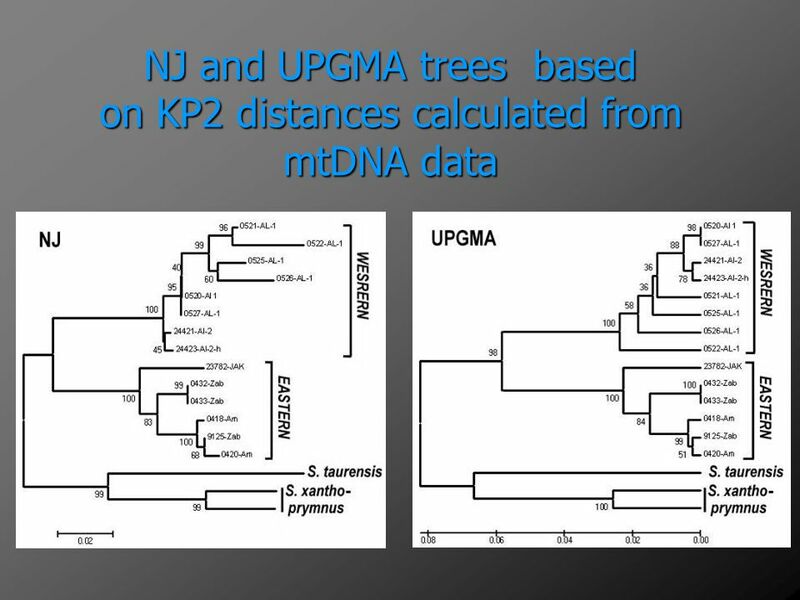 Phylogenetic trees Sushmita Roy BMI/CS 576 Sep 23 rd, 2014. 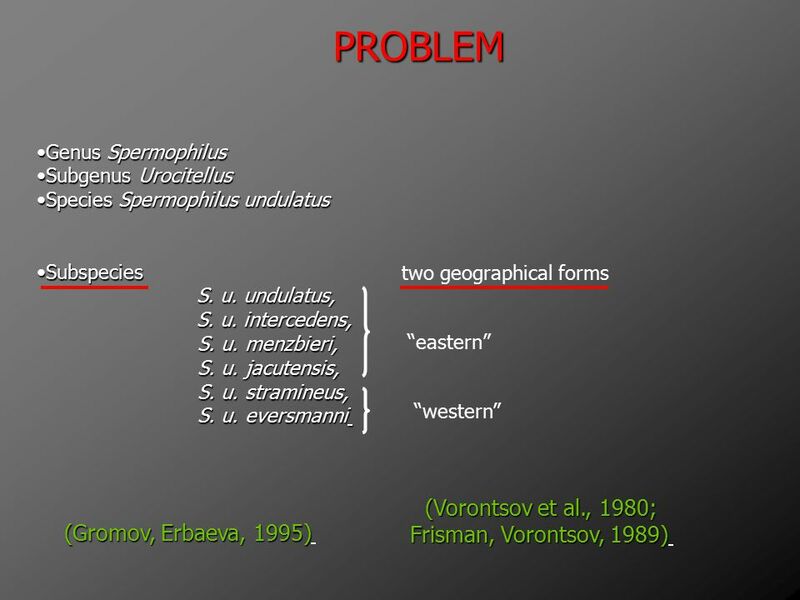 GENETICAL FEATURES OF CHROMOSOMAL FORM «C» OF MICROTUS MAXIMOWICZII FROM THE RUSSIAN FAR EAST GENETICAL FEATURES OF CHROMOSOMAL FORM «C» OF MICROTUS MAXIMOWICZII. 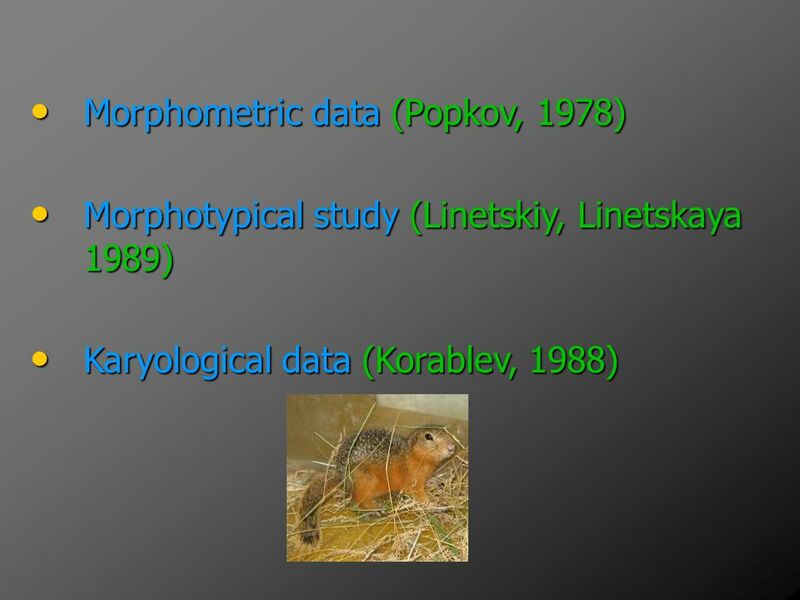 The Barcode Gap Speciation or Phylogeography? BANBURY 3 ? Graham Stone, Richard Challis, James Nicholls, Jenna Mann, Sonja Preuss Mark Blaxter Institute. From population genetics to variation among species: Computing the rate of fixations. 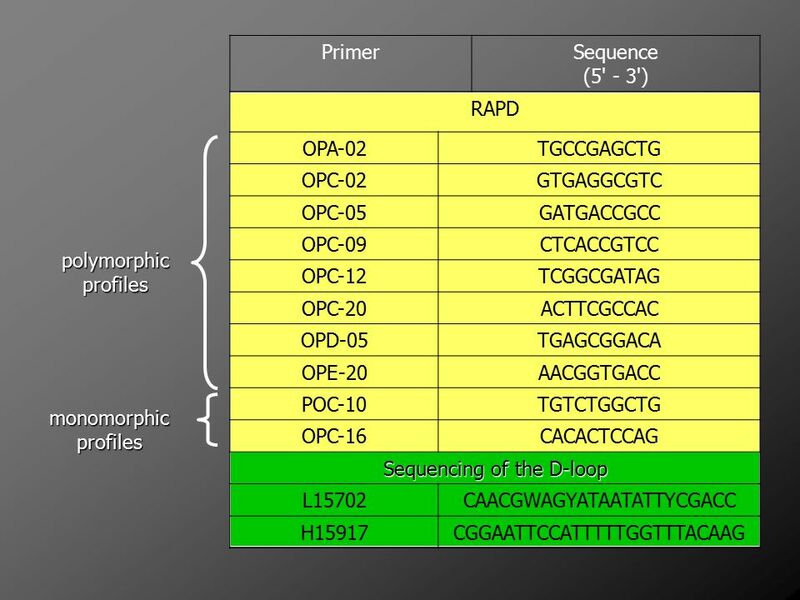 Introduction to Computational Biology Topics. 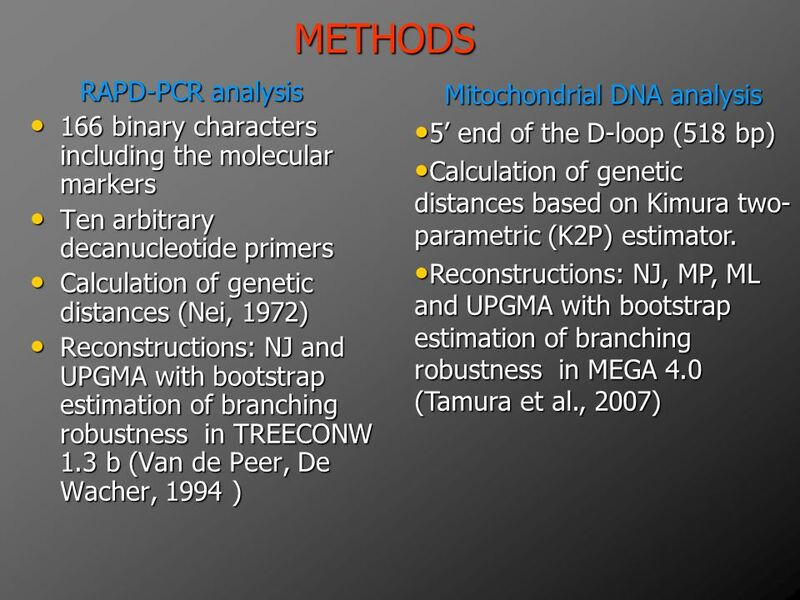 Molecular Data Definition of data  DNA/RNA  Protein  Expression Basics of programming in Matlab  Vectors. Molecular Evolution with an emphasis on substitution rates Gavin JD Smith State Key Laboratory of Emerging Infectious Diseases & Department of Microbiology. Dispersal models Continuous populations Isolation-by-distance Discrete populations Stepping-stone Island model.